Titus was an uncircumcised Greek convert to Christ (Gal. 2:3). Titus personally refreshed and comforted Paul during a low period of depression (2 Cor. 7:6-7). Titus was a man of superb character (2 Cor. 12:18). Titus is last found going to serve in Dalmatia (2 Tim. 4:10). Paul calls Titus his “true child in the faith” (Titus 1:4). They must have had a close friendship with one another. Paul may have written this letter from Corinth, because he sends it with Apollos (Titus 3:13), who was a leader in Corinth (Acts 18:24–28; 19:1; 1 Cor. 1:12; 3:4–6; 4:6; 16:12). Though this is not certain. If we accept that Paul had been imprisoned from AD 61-63, then this letter would be written after this time. Paul makes no mention of the Neronian persecution in AD 64, and he was writing before the winter months (Titus 3:12). Hiebert dates the letter to the fall of AD 63. (1:1) “Paul, a bond-servant of God and an apostle of Jesus Christ, for the faith of those chosen of God and the knowledge of the truth which is according to godliness.” Paul saw his role as an “apostle” as being conflated with his role as a “servant.” All Christian leaders should see their role as servant leadership. We are “chosen” according to God’s foreknowledge (1 Pet. 1:1-2). (1:2) “In the hope of eternal life…” Our “godliness” (v.1) comes from “the hope of eternal life.” It’s as we realize that God has solved our greatest possible fear (where we go when we die) that we are free to give our lives away. We already have eternal life currently (Jn. 5:24), but we also look forward to our eternal life in heaven. This is a case of “already-not-yet” language. “…which God, who cannot lie…” How can we know that eternal life is real? Paul grounds this claim in the honesty and veracity of God. God cannot lie, and he promised this to us. “…promised long ages ago” is literally “before times eternal” or “before the beginning of time” (NIV). Some commentators understand “His word” to refer to the gospel message. This is a possible reading. However, the language of being “manifested” (ephanerōsen) is often used of Jesus (Jn. 21:1; 1 Tim. 3:16; Heb. 9:26; 2 Tim. 1:10), who is called God’s “word” (logos). It constantly shocked Paul that God would “entrust” him of all people with this message (1 Cor. 15:9; Eph. 3:8; 1 Tim. 1:11-13). (1:4) “To Titus, my true child in a common faith: Grace and peace from God the Father and Christ Jesus our Savior.” By calling Titus his “true child in the faith,” Paul implies that he personally led Titus to Christ. (1:5) “For this reason I left you in Crete, that you would set in order what remains and appoint elders in every city as I directed you.” The planting of a church in Crete simply doesn’t fit with the brief visit mentioned in Acts 27:7-9, where Paul merely sailed past Crete. Paul must have planted this church sometime after the end of the book of Acts on a fourth missionary journey. The job wasn’t done in Crete when Paul left. He told Titus to stay behind to make sure leaders were recognized to lead this church. Paul didn’t do all of the Christian work himself. He was able to delegate important work to others. Paul’s method was to have plurality in leadership. Note that there are plural “elders” in every singular “city.” This fits with Paul’s example in other contexts (Acts 14:23). Why is quality leadership so important in the church? One reason is that there are false teachers who are constantly vying for the attention of believers and non-believers alike. (1:10) “For there are many rebellious men, empty talkers and deceivers, especially those of the circumcision.” Notice the word “for,” which connects the importance of leadership (vv.5-9) over and against false teachers (v.10). Rebellion is a serious sin. We often think that we’re merely rebelling against people, when in fact, we often are rebelling against God. The false teachers in this church were a pseudo-Christian Jewish faction (“those of the circumcision”), who were spreading “Jewish myths” (v.14). Yet, Paul states that there were others as well, because he mentions the Jewish false teachers in a separate category (“especially those of the circumcision”). (1:11) “Who must be silenced because they are upsetting whole families, teaching things they should not teach for the sake of sordid gain.” In this situation, these teachers were leading away entire families. The NASB and ESV render anatrepousin as “upsetting whole families,” but the NIV (“ruining”) and NLT (“turning whole families”) seems to fit better in context. Paul isn’t merely concerned that these people were upset, but that their faith was being ruined. The term for “silenced” (epistomizein) is used only here in the entire NT. It literally means “to close the mouth by means of a muzzle or gag.” In certain cases, Christian leaders should refuse to allow false teachers to share their doctrine in the church. It’s one thing if false teachers want a dialogue or debate. But what if they merely want to circumvent the leadership and spread false teaching? Verse 9 tells us that we should “refute” false teaching and verse 13 states that we should “reprove them severely.” Paul isn’t advocating a lack of debate. He is advocating for not giving false teachers an opportunity to teach at Christian meetings. (1:12) “One of themselves, a prophet of their own, said, ‘Cretans are always liars, evil beasts, lazy gluttons.’” Paul cites Epimenides—a sixth century BC philosopher. (1:12) Is this a self-defeating statement? (1:13) “This testimony is true. For this reason reprove them severely so that they may be sound in the faith.” The goal of reproof is to win the person over to a sound faith. (1:14) “Not paying attention to Jewish myths and commandments of men who turn away from the truth.” The false teaching in Crete must have been similar to that in Ephesus (1 Tim. 1:4). Titus isn’t supposed to “pay attention” to these myths. This could mean that Titus shouldn’t allow his opponents to set the rules for the debate, and instead, he should reprove them with truth. It could also mean that Titus should not waste inordinate time arguing with these people (Prov. 26:4-5). (1:15) “To the pure, all things are pure; but to those who are defiled and unbelieving, nothing is pure, but both their mind and their conscience are defiled.” Most commentators hold that the false teachers were claiming that certain foods were evil, and this was the cause of their disputes (cf. 1 Tim. 4:3; Rom. 14:20). Paul must have been refuting some sort of man-made tradition. Food seems like a plausible option—albeit uncertain (cf. Mt. 15:10-11; Mk. 7:14-19; Lk. 11:37-41; Acts 10:9-15, 28). (2:1) “But as for you, speak the things which are fitting for sound doctrine.” This verse really belongs more naturally in chapter 1, rather than in this chapter. Contrary to postmodern teaching, doctrine is important. There are accurate and inaccurate interpretations of the Bible. These false teachers (mentioned in chapter 1) were ruining people’s lives, and Paul urges Titus to know sound doctrine and to teach it. “Temperate” (nephalious) primarily means “pertaining to being very moderate in the drinking of an alcoholic beverage, temperate, sober” (BDAG), but can also have the broader meaning of “pertaining to being restrained in conduct, self-controlled, level-headed” (BDAG). It means at least sober from alcohol, but probably implies more than this. This passage doesn’t ban all alcoholic consumption. Instead, it teaches us not to be addicted or “enslaved to much wine” (v.3). “Dignified” (semnous) means “worthy of respect/honor, noble, dignified, serious” (BDAG). This means that they have a type of character that garners the respect of those around them. “Sound in faith” (hygiainontas) is the root for our modern word “hygiene.” We need a healthy faith—not an unhygienic faith! “[Sound] in love” is having agape love for others. “[Sound] in perseverance” (hypomone) means “the capacity to hold out or bear up in the face of difficulty, patience, endurance, fortitude, steadfastness, perseverance” (BDAG). “Reverent” can be translated as “honorable” (NLT) or “venerable” (BDAG). “Malicious gossips” is the Greek diabolous (“slanderers”). (2:4-5) “So that they may encourage the young women to love their husbands, to love their children, 5 to be sensible, pure, workers at home, kind, being subject to their own husbands, so that the word of God will not be dishonored.” Older women are supposed to teach and encourage younger women in their roles as wives and mothers. Modern culture often looks down on women who stay at home with their children. But the Bible has a high view of this incredibly important ministry of raising children. (2:5) Are women supposed to be barefoot and pregnant at home? (2:7-8) “In all things show yourself to be an example of good deeds, with purity in doctrine, dignified, 8 sound in speech which is beyond reproach, so that the opponent will be put to shame, having nothing bad to say about us.” How can Christians avoid persecution? 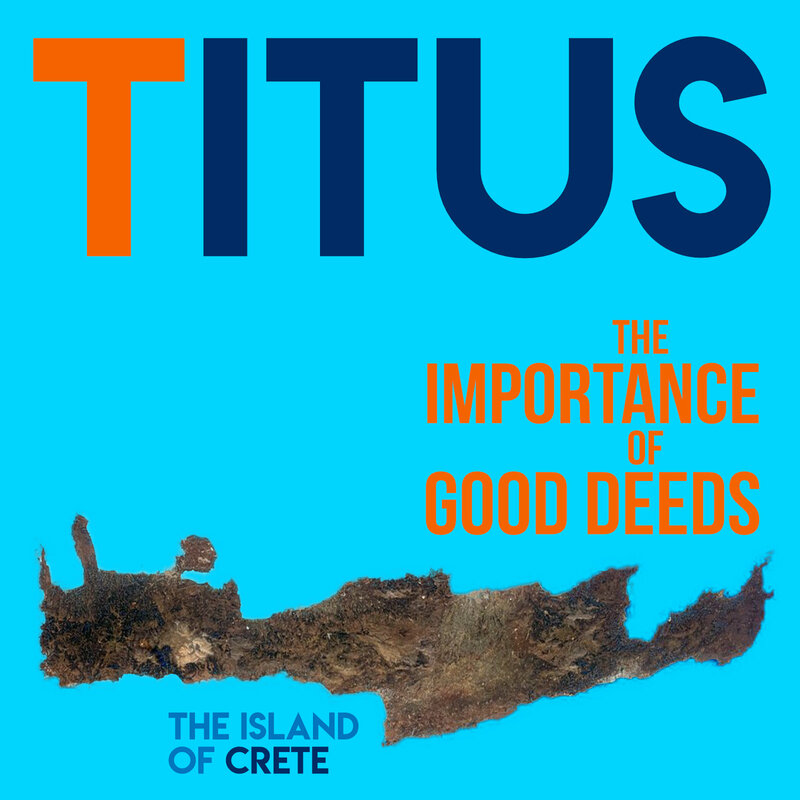 Paul tells Titus to have good deeds, so that the accusations will be bankrupt, lacking any credibility. (2:10) “Not pilfering, but showing all good faith so that they will adorn the doctrine of God our Savior in every respect.” The term “adorning” (kosmeo) is the root from which we get our term “cosmetic.” Just as cosmetics beautify a woman, our good deeds are supposed to “adorn the gospel.” Of course, Paul chooses his words very carefully: Good works do not substitute for the message, but they do make the message more attractive. (2:11) Does this passage teach universalism? (2:12) “Instructing us to deny ungodliness and worldly desires and to live sensibly, righteously and godly in the present age.” Grace does not support licentious living. Grace teaches us to live a loving and ethical lifestyle. When we come under grace, we begin to have a change of attitude toward living selfishly. The focus is to leave selfishness (“worldly desires”) and to move toward altruistic love (“good deeds” v.14). (2:13) “Looking for the blessed hope and the appearing of the glory of our great God and Savior, Christ Jesus.” Paul taught the imminence of Jesus’ return. (2:13) Does this passage support the deity of Christ? (2:14) “[Jesus] gave Himself for us to redeem us from every lawless deed, and to purify for Himself a people for His own possession, zealous for good deeds.” God’s saving work was both to forgive us for our sins (“redeem us for every lawless deed”) and to create us for good works (“zealous for good deeds”). The same sequence can be found in Ephesians 2:8-10. (2:15) “These things speak and exhort and reprove with all authority. Let no one disregard you.” Leaders have spiritual authority. They do not have authority in secular matters for their people, but they do have authority in spiritual matters. One of the biggest areas of their authority is in the teaching of the word (“speak and exhort and reprove”). Based on verse 1: What are some ways that we might avoid falling into poor doctrine as a church? Based on verse 12: If we’re truly under grace, what’s to stop us from living selfishly? In what way does the grace of God change our inner motivations to live a loving lifestyle? It isn’t just that we should submit to the government. We should be ready to serve for “every good deed.” This means that the government should see believers as loving and helpful, rather than as dangerous. (3:2) “To malign no one, to be peaceable, gentle, showing every consideration for all men.” The term “malign” (NASB) can also be translated “slander” (NIV). (3:3) “For we also once were foolish ourselves, disobedient, deceived, enslaved to various lusts and pleasures, spending our life in malice and envy, hateful, hating one another.” Notice the connecting word (“For…”). Verse 3 is built upon verse 2. What is our basis for being peaceful, gentle, and considerate to the world? We were once just like these people! Believers should never look down upon those in the world, having a self-righteous posture. Instead, we should remember that we were fairly recently in their shoes. Isn’t this an exaggerated list of negative attributes? Isn’t this a pessimistic view of human nature? As we come under grace, God reveals the selfishness in our lives to deeper and deeper degrees. We see our sin to a much deeper degree, even as we see God’s acceptance and grace for us at the same time. How often do we disobediently disagree with another person’s ideas, simply because they weren’t our own? How often do we assume that we are in the right, and never even consider if we’re deceiving ourselves in our pride or ego? When others succeed, do we celebrate this, or do we secretly envy them? Do you have people in your life whom you hate or generally can’t stand to be around? I remember sitting through my final quarter in my undergraduate degree with a loud, obnoxious, and infantile person who was taking the class. Every time he opened his mouth to share his (never ending!) opinions, I cringed, rolled my eyes, or even openly argued with him. He was irrational and foolish, and the rest of the class couldn’t stand him either. One day, as I was sitting next to my classmate, I honestly wondered how much money someone would have to pay me in order to be this guy’s friend for the rest of my life. (It was one of those odd thought experiments that you play in class, when you’re bored and you don’t want to focus on your professor). Honestly, how much would it take for me to be this guy’s friend for life? 10 million dollars? A billion? I realized that I would probably need to be “Bill Gates rich” in order to be friends with him! I felt that the Holy Spirit spoke to me in this moment: Not only does God want to be this guy’s friend, but God has been pursuing him for his entire life, patiently waiting for the man to turn to him. God not only loved this guy free of charge, but he actually sacrificed the costly gift of his Son so that he could pursue him. We might think that Paul’s statements in this verse are exaggerated, but this is only because we don’t realize how far we fall short of God’s picture of love. We read about his great love in the following verses. (3:5) “He saved us, not on the basis of deeds which we have done in righteousness, but according to His mercy, by the washing of regeneration and renewing by the Holy Spirit.” What was the basis of our salvation? It was not good works, but rather it was his great mercy. He washed us and cleaned us by making us into a “new creation” (2 Cor. 5:17). (3:6) “Whom He poured out upon us richly through Jesus Christ our Savior.” He poured out his love into our hearts through the Holy Spirit (Rom. 5:5). (3:7) “So that being justified by His grace we would be made heirs according to the hope of eternal life.” Our justification is the basis for our adoption. (3:8) “This is a trustworthy statement; and concerning these things I want you to speak confidently, so that those who have believed God will be careful to engage in good deeds. These things are good and profitable for men.” This previous section is a “trustworthy statement.” We can bank our lives on these foundational truths about God’s grace and love toward us. Our good deeds do not save us (v.5), but now that we’re saved, we should engage in good deeds. Paul writes that Titus should speak “confidently” to the believers about this subject. As leaders, we should never cower from calling people to a radical life of love for Christ and others. (3:9) “But avoid foolish controversies and genealogies and strife and disputes about the Law, for they are unprofitable and worthless.” See “Introduction to 1 & 2 Timothy” for a description of the false teaching mentioned here (see the heading “The False Teaching in Ephesus”). (3:11) “Knowing that such a man is perverted and is sinning, being self-condemned.” Such a person is “wholly out of touch with truth.” The use of the passive voice (“is perverted”) could imply Satanic involvement. (3:12) “When I send Artemas or Tychicus to you, make every effort to come to me at Nicopolis, for I have decided to spend the winter there.” We don’t know anything about Artemas, other than the fact that his name sounds Greek. Tychicus was a trusted colleague of Paul (Acts 20:4; Eph. 6:21-22; Col. 4:7-8; 2 Tim. 4:12). Crete is near Greece, and Nicopolis (literally “victory” + “city”) was on the western coast of Greece. (3:13) “Diligently help Zenas the lawyer and Apollos on their way so that nothing is lacking for them.” Zenas and Apollos most likely brought this letter to Titus from Paul. We don’t know anything about Zenas beyond his name being Greek. Yet he is called a lawyer. Does this mean that he was a lawyer in Jewish law or Roman law? Apollos was a skilled teacher and leader (Acts 18:24–28; 19:1; 1 Cor. 1:12; 3:4–6; 4:6; 16:12). (3:15) “All who are with me greet you. Greet those who love us in the faith. Grace be with you all.” Paul wasn’t alone when he wrote this letter. Based on verse 10: Why does Paul treat division and divisiveness with such severity? Hiebert, D. E. (1981). Titus. In F. E. Gaebelein (Ed. ), The Expositor’s Bible Commentary: Ephesians through Philemon (Vol. 11, p. 423). Grand Rapids, MI: Zondervan Publishing House. Hiebert, D. E. (1981). Titus. In F. E. Gaebelein (Ed. ), The Expositor’s Bible Commentary: Ephesians through Philemon (Vol. 11, p. 427). Grand Rapids, MI: Zondervan Publishing House. Hiebert, D. E. (1981). Titus. In F. E. Gaebelein (Ed. ), The Expositor’s Bible Commentary: Ephesians through Philemon (Vol. 11, pp. 429–430). Grand Rapids, MI: Zondervan Publishing House. Hiebert, D. E. (1981). Titus. In F. E. Gaebelein (Ed. ), The Expositor’s Bible Commentary: Ephesians through Philemon (Vol. 11, p. 432). Grand Rapids, MI: Zondervan Publishing House. Hiebert, D. E. (1981). Titus. In F. E. Gaebelein (Ed. ), The Expositor’s Bible Commentary: Ephesians through Philemon (Vol. 11, p. 434). Grand Rapids, MI: Zondervan Publishing House. Hiebert, D. E. (1981). Titus. In F. E. Gaebelein (Ed. ), The Expositor’s Bible Commentary: Ephesians through Philemon (Vol. 11, p. 443). Grand Rapids, MI: Zondervan Publishing House. Hiebert, D. E. (1981). Titus. In F. E. Gaebelein (Ed. ), The Expositor’s Bible Commentary: Ephesians through Philemon (Vol. 11, p. 448). Grand Rapids, MI: Zondervan Publishing House. Hiebert, D. E. (1981). Titus. In F. E. Gaebelein (Ed. ), The Expositor’s Bible Commentary: Ephesians through Philemon (Vol. 11, p. 449). Grand Rapids, MI: Zondervan Publishing House.